From L to R: Bob Forsyth, Ed Owen, Adrian Walker. London’s Air Ambulance, the charity that delivers a 24/7 advanced trauma team to critically injured people in London, has strengthened its board with the appointment of three new trustees. The new Trustees, Adrian Walker, Bob Forsyth and Ed Owen together bring a wealth of experience across the charity, banking and finance, communications, accounting, audit and governance, and medical research sectors. Adrian Walker, Managing Director, Head of Global Transaction Banking, Lloyds Banking Group joined Lloyds Banking Group as Managing Director of Leveraged Finance in 2007 and became Head of Global Transaction Banking in November 2015. Adrian comes to London’s Air Ambulance with over 30 years’ experience spanning retail, corporate and investment banking activities and is a highly experienced leader and strategist, proficient in leading transformational change and business development. Bob Forsyth, Senior Assurance Partner, Ernst & Young LLP, has been a partner for Ernst & Young since 1992, taking on various management roles from Head of Marketing to his current role as UK Head of Audit Quality. As a client service partner, Bob has helped many companies improve their financial and corporate governance, and developed the firm’s best practice model for audit committees. Before joining Medicines Discovery Catapult as Head of Engagement & Communications in December 2016, Ed Owen was Chief Executive of the Cystic Fibrosis Trust, one of the UK’s leading medical research charities. Under his leadership, the trust implemented a new research strategy and established plans for a national clinical trials platform in cystic fibrosis. Ed now leads work at the Catapult to ensure medical research charities play a greater role in future drug discovery and development in the UK. Between 1997 and 2005 Ed was a government adviser in the Home Office and Foreign & Commonwealth Office. 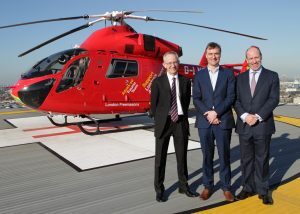 London’s Air Ambulance treats on average five critically injured people in London each day, performing medical interventions at the scene of the incident which are normally only found in a hospital emergency department. Barts Health NHS Trust provides the doctors and some financial support and the London Ambulance Service provides the paramedics and expertise to dispatch the service. The charity relies heavily on voluntary donations and has a world class reputation for delivering clinical innovation and excellence at the scene of the incident.